Dubai: Emirates airline said on Wednesday it increased profits and carried more passengers in the six months leading to September 30 amid growing global political instability and fluctuating oil prices. 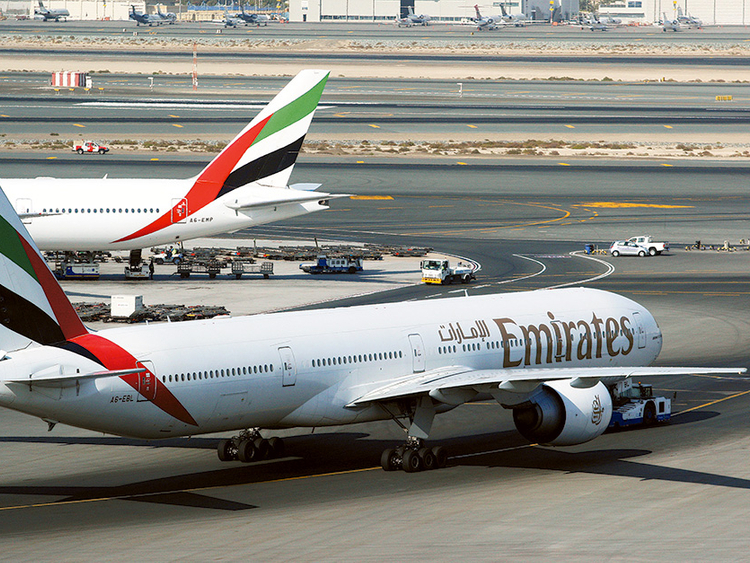 Dubai’s flagship carrier reported an 8.2 per cent rise in net profits to Dh1.9 billion. In contrast, the airline doubled (103 per cent) its net profit when it reported its six month results in November 2013. Investment Corporation of Dubai-owned Emirates said it suspended the highest number of routes in a year in response to the Ebola outbreak in West Africa and safety fears in Iraq and Ukraine. The airline also temporarily grounded up to 22 aircraft a month over 80 days due to the temporary runway closure at Dubai International. Shaikh Ahmad Bin Saeed Al Maktoum, President of Dubai Civil Aviation and Chairman and CEO of Emirates airline and Group, said in a statement the airline bore the brunt of the closure. Emirates said revenue was Dh44.2 billion, up 11 per cent in the six month period compared to Dh39.8 billion in the same period a year ago. Fuel costs accounted for 38 per cent of operating costs, down a per cent on a year ago, as oil prices collapsed in the second half of the calendar year. “As with other airlines, Emirates will see benefits from the record low oil prices over the coming year, it will have to navigate the ongoing external challenges but has enormous flexibility in its network to redeploy capacity to the strongest markets away from trouble spots,” said John Strickland, director of UK-based JLS Consulting, by email. “This reflects the solid foundation of its Dubai hub,” he added. The airline continued to take delivery of new widebody aircraft — six Airbus A380s and seven Boeing 777s — as it looks to pinch market share from European and American rivals. A further 11 new aircraft are scheduled to be delivered before March 31, 2015. Emirates said earlier this week it will place superjumbo A380s on more US routes, in what is seen as a challenge to its European and US competitors on the transatlantic routes. Emirates A380 fleet will be 55 aircraft by the end of the calendar year and 68 by the end of 2015, said Thierry Antinori, Emirates airline executive vice-president and chief commercial officer, this week. Emirates added nine new destinations since April 1, which Strickland said, “represents strong growth compared to many players”. Emirates has carried 23.3 million passengers in the six months to September, 8.4 per cent more than a year ago. Passenger capacity measured in available seat kilometres increased 6.5 per cent, the airline said, and passenger traffic carried measured in revenue passenger kilometres rose 9.8 per cent. Load factor — or percentage of seats filled — was 81.5 per cent.